Kaspersky Antivirus is the universally identified security software and one of the most precious tools to detect and remove computer viruses actively. As it offers comprehensive protection to your PCs against all internet and computer threats like spyware, worms, malware, Trojans, etc. you must have a longer trial period to utilize the most of the security. So, here you could get 90 days of free subscription of the latest KAV 2013 for free. You just need the serial key for activating Kaspersky Antivirus 2013. Kaspersky Antivirus 2013 is the latest security product from Kaspersky and it follows “Second-generation Heuristic Analysis” and “Cloud-based security” which removes unknown threats and provide complete PC protection. It has “Vulnerability Scan” to detect dangerous applications, malicious programs and other potential threats. The interface is very similar to previous version – Kaspersky Antivirus 2012 and the installation becomes so easy. The most important update of the latest version is its compatibility with Windows 8 operating system which is worth-praising. If you want to have full review of Kaspersky Antivirus 2013, visit here. 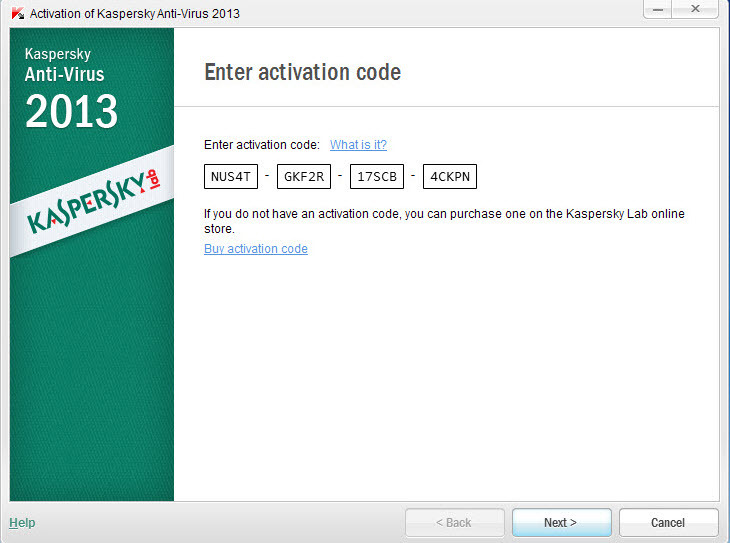 Download the setup of Kaspersky Antivirus 2013 90 days subscription with built-in activation code. The installer file size weighs 143 MB. This edition was developed for Windows 8, however it is compatible with other Windows OS versions too. Install the software after downloading the file and it is mandatory that you "DON'T REBOOT" after the installation. Choose "Reboot Later", it will ask for the activation code. Choose "Activate Trial Version" and click "Next". That's it you are done with the activation. You have now activated with 90 Days free subscription period. 1) Firstly, download Kaspersky Antivirus 2013 setup file. 2) Double-click the set-up file to start installation. Click the “Install” button to begin setup process. 3) At the end of installation, select checkbox “Start Kaspersky Antivirus 2013” and click “Finish” button. 4) A new window appears for “Activation of Kaspersky Anti-Virus 2013”. Enter the below activation or serial key in their respective fields. Important Note: This activation key only works for new installations, not for previously installed KAV 2013. If you use the above activation key on already installed KAV 2013, it shows error message saying “Trial Expired”. So, you should uninstall the previous one and download using “Step 1” above. Remember this is special setup file meant for just 90 days activation. 5) Upon entering the activation key, KAV 2013 will be validated and click on “Finish” to end the process. 6) Start the KAV 2013 application and click “Licensing” on right-side below of its interface. It looks like below image. 7) If you don’t get the 90 days activation, refer to “Important Note” above and try again.